With so many different types of printers available, you can definitely benefit from the ability to print almost any document or item. From magazine printing to professional large format printers for design teams and architects, printers are definitely an essential part of our daily life. But it all depends on the quality of printing that you can expect and this is why buying the right printer is so important. Large format printers are used for a variety of applications in various industries, including architects that need to print out house plans, as well as graphic design teams that need to print large scale images for a marketing campaign. These printers are extremely effective and reliable, making it a great addition for any design team. Large design teams often have multiple printers available to them, to effectively handle their growing printing requirements. Large format printing can be used for a variety of applications, including printing banners, signs, vehicle wraps and posters. These items can be used for marketing campaigns and this is why high quality printing is a great benefit to have. In addition to this, you can also print other specialty products like billboards as well as custom wallpaper and murals. These are used in environments like retail stores, as well as airport terminals. You can also print custom floor graphics and you can even print directly onto carpet with dye-sublimation. But these machines are specifically designed for large format printing, and they are not ideal for every day, basic document printing. Because of their size they will be slightly more expensive to maintain in terms of consumables and parts, which is why you need to shop for a durable machine from a reputable supplier. You can also benefit from buying a popular brand like Xerox as these machines are known for their durability as well as the cost effective printing abilities. 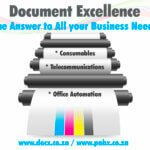 Document Excellence specialises in large format printers and we are also a Xerox authorised partner. We have a wide variety of printer units available and will gladly help you to find the ideal printing unit for your needs. Contact us today to find out how we can help you with all your magazine printing needs.